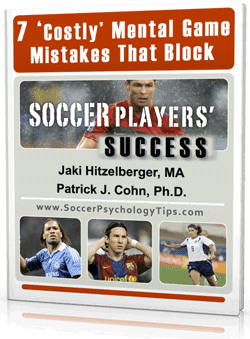 Do you or your soccer players need to “get out of your own way” when competing? When an athlete is unable to get out of his own way, the mind is interfering with his physical talent. In a general sense, your mind sabotages your physical skills. The mental game is misfiring. 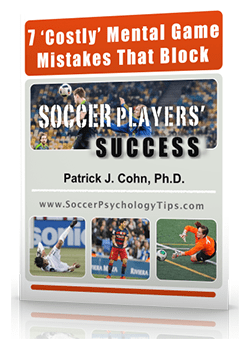 Most of the time, soccer players who can’t “get out of your own way” try way too hard, force their game, think too much, or over-analyze. For example, if you second-guess whether to pass the ball or shoot or if you force a through ball that isn’t on. Many athletes described an experience in which they felt like observers (of their own performance) allowing their performance to just happen. As if they were performing on autopilot. Thus if you over think or over analyze your game, try to force it on every play or shot, and don’t trust your performance, you are guilty of getting in your own way. When you get out of your own way, you allow yourself to play freely without added pressure. You allow yourself to just do it and trust in your skills. 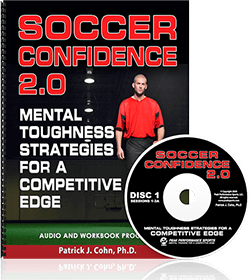 To help our athletes get out of their own way, we created “Soccer Confidence” CD and Workbook Program, which is our first soccer specific program. 2. Trust your practice. 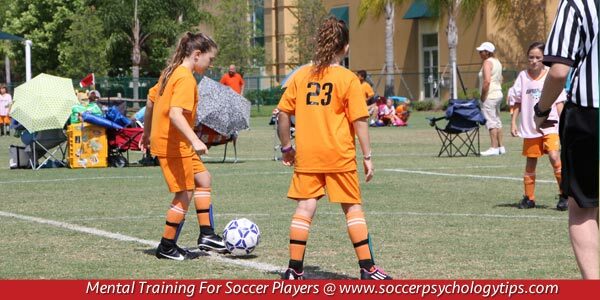 The purpose of practice is to learn the skills and strategies to perform in competition. The purpose of competition is to let yourself play. Let go of the “how tos” (your technique or mechanics) and allow yourself to let it happen. So instead of telling yourself to get your toe down, head down, and follow through on shots, simply focus on getting the shot low and to the corners. 3. Go with the flow and don’t over-analyze your performance. Over analyzing your performance only makes matters worse. Be flexible with the situations that might happen during a game. Accept the fact that you will make mistakes. Remember that how you react to the mistake is most important. 4. Focus in the moment instead of the results. A focus on results does not let you play in the moment. Think more about how you can make an impact one play at a time.